I have a collection to show you today that has my name all over it. No, it really doesn't have my name all over it, nor does it have anything to do with me. The reason I say that though is that these types of colors are what I'm all about when it comes to nail polish. They are sparkletastic and holorific and everything in between. This is the Cupcake Polish Las Vegas Showgirls collection. This collection releases tomorrow 8/1! These are some other beauties I received in Las Vegas during Cosmprof. I've been stalking Cupcake Polish on social media for awhile. Sara of Cupcake Polish is a true talent, and I've always oogled over her polishes online. I can now attest to the fact that her polishes in person are just as amazing, if not, more amazing in person! 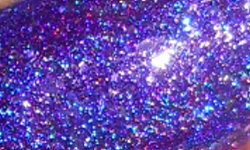 Copa Girls is a purple linear holo mixed with silver flakes and holo microglitter. 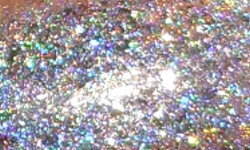 Jubilee is a silver linear holo mixed with silver flakes and holo microglitter. 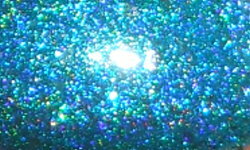 Bluebell Girls is a teal linear holo mixed with silver flakes and holo microglitter. Color: These are all intense and richly pigmented shades. I notice in some other holos (from some other brands) that the intensity of the base color can be dulled when you add the holo magic to them. This isn't the case with these colors at all. They are all very saturated. The holo, silver flakes, and holo microglitter combination in these colors is absolute polish wizardry too. Formula: These have excellent easy to use and opaque formulas. These applied beautifully without any snags. I used 2 coats per swatch above. Price: This collection releases tomorrow 8/1 at 11am central time on Cupcake Polish. These polishes are $13.00 each, or you can purchase the entire set for the discounted price of $60.00 if purchase within the first 24 hours of release. You can also use this awesome discount code COSMOPROF2015 for 10% OFF your order through 9/1/15! Overall: These are true polish masterpieces. I've been really into nail polish for 7 years now. These are some of the best nail polishes I've come across in my nail polish history. They're beautiful and so thoughtfully well made. You definitely need these in your nail polish collection. I highly recommend buying the entire set. There is also a pink and black holo I did not show you. I'll be purchasing those tomorrow! Need I say it? Must have! Go get these!